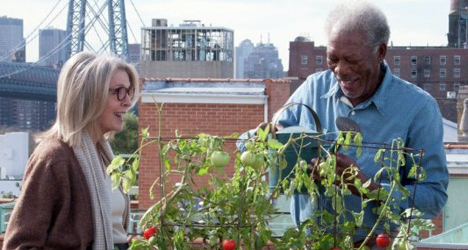 Diane Keaton and Morgan Freeman star in "5 Flights Up." After being married for 40 years, Alex (Morgan Freeman) and Ruth (Diane Keaton) decide that it might be time to move out of the Brooklyn apartment they’ve lived in for decades. In making the biggest decision of their lives, however, Alex and Ruth must come to terms not only with getting older and accepting the aging process, but with letting go of the place of their dreams. If there is a strength to be found in “5 Flights Up,” it is the chemistry between Freeman and Keaton. The moments in which they show affection towards one another are well performed, but it extends further than that. There’s a sense of frustration that Keaton is able to convey with her husband that is entirely set in his ways that is completely believable for a couple that has been married for decades. It’s an acknowledgement that they have been together for years, that they love each other, but sometimes they can be extremely difficult to be with. It’s a subtle note that is clearly amplified by two great actors. As Alex and Ruth begin to interact with those looking to buy their apartment, nearly every person who walks through the door is a weird caricature of an actual human. 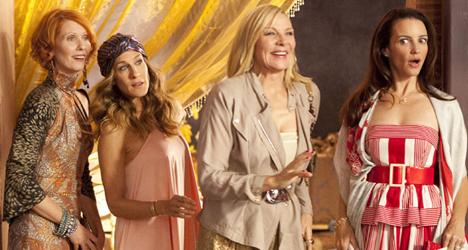 Yes, it is supposed to be a satirical look at a “younger” generation, but not every single potential buyer has to have a larger than life quirk or be intentionally off-putting. Of course, most of these issues can be attributed to a less than stellar screenplay. There are some nice touches, like Freeman’s character being confused about not being able to hear on an iPhone that he is holding backwards, but for the most part, his “crotchety old man” dialogue and frustration with young people is generic and cliché. The most glaring script problem, however, comes from the sideplot of a terror suspect on the loose and the resulting news coverage. It’s a plotline that only serves for a loosely connected metaphor that doesn’t register or resonate on any level. Though are some interesting scenes that show Alex and Ruth as they came to be,“5 Flights Up” is just about as tepid as a film can be. Though some very mild fun that can be had with watching an intense and ongoing real estate transaction happen, that’s about the extent of the level of enjoyment about the film. When it comes down to it, “5 Flights Up” says nothing of importance, is oddly ageist, and is a giant waste of time for its two talented leads.